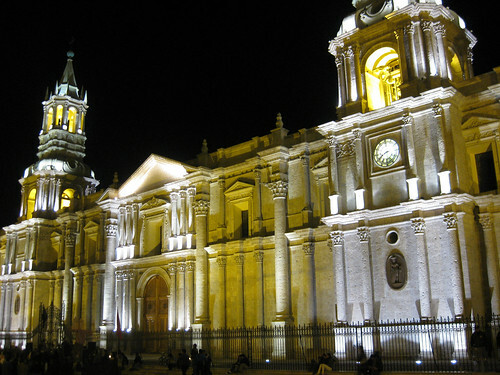 The city of Arequipa is nestled high among the dramatic volcanoes and mountains of southern Peru. It is known as La Ciudad Blanca (The White City) as its buildings are constructed from the white volcanic stone, sillar, that is widely available in the area. Arequipa is also casually referred to as the ‘Berkeley’ of Peru, because of its leftist, secessionist leanings and frequent street protests. Fulfilling this reputation, crowds complete with paper mache effigies of political figures and banners took over the streets several times a day (and strangely, in the middle of the night). After picking up my mother at the tiny airport, we set off to explore Arequipa’s dramatic cathedrals, plazas lined with arched colonnades, and dodge the aggressive cabs that own the streets. At one intersection, the city tried to give pedestrians a slight advantage by installing a stoplight with an electronic singing ‘walk’ sign. It was a mostly unsuccessful experiment as cabs ran the red light for over half of the time allotted for pedestrians. We took a peaceful break from the hectic traffic by visiting the Monasterio de Santa Catalina. For its first 250 years, the monastery operated partially as a repository for rich, protected girls of the Arequipa upper class. Many of the ‘nuns’ had ornate tapestries and chandeliers to decorate their ‘cells’ and servants to cook and clean for them. Upon instituting austerity reforms in 1870 the monastery changed its hedonistic ways and became closed to society. In 1970 the small group of remaining nuns moved to a newer convent, and the monastery was opened to the public. This giant cloistered 400-year old monastery takes up a complete city block. Winding through its narrow alleys between bright orange and blue adobe buildings, the sounds of honking horns and hawking vendors were blissfully muted. The next morning we visited the Inca Ice Maiden Juanita at the Museo Santuarios Andinos. 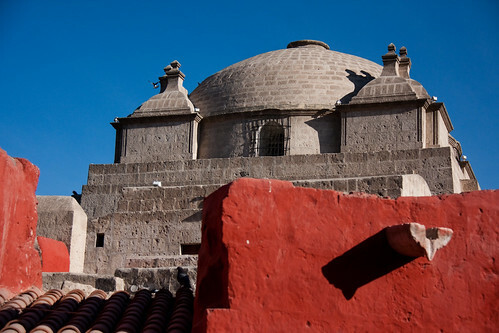 This museum displays the incredible tombs that were unearthed high on the peak of Volcan Ampato near Arequipa. 500 years ago several young girls were sacrificed to Inca mountain gods and buried with various gold statues, dolls, and vessels. The tombs were covered by snow and the bodies of the sacrificed girls were preserved frozen for hundreds of years before volcanic eruptions melted snow and exposed the tombs in the 1980s. Juanita now resides in a -20 C freezer in the museum surrounded by dimly lit display cases containing offerings that were buried with her. Her skin and hair is still intact, and she is curled up in a position that I often adopt when reading a book in bed. Inspired by the Inca handiwork in the museum, we next spent many hours trolling the various trinket shops, clothing stores, and antique vendors that fuel Arequipa’s booming tourist trade. We also visited the Alpaca 111 factory outlet to shop for some bargains and visit their small menagerie of camelids. To keep us warm in the chilly Peruvian highlands we bought some baby alpaca sweaters and hats. We also admired the super-soft vicuña scarves, but they were only for touching, not for buying, since they would set you back over $1500 USD. Vicuñas are a wild relative of alpacas and llamas, and were near the verge of extinction until Peru instituted strict protection laws. 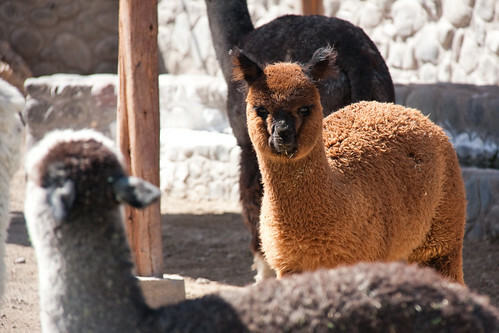 Alpaca 111 is the only store licensed to sell vicuña products in Peru. I quickly decided that I want a small herd of alpacas after cooing over their teddy-bear faces and fuzzy soft wool. Tomorrow on our drive to Colca Canyon we will pass through the natural habitat of camelids, so we hope to see some wild herds of vicuñas, alpacas, and llamas. Posted on July 18, 2009 by Kristin	This entry was posted in Arequipa, Peru. Bookmark the permalink.